It’s recently been reported by Palatinate that undergraduates in the Law and Business schools will have some lectures timetabled outside of normal teaching hours next year. From October, Law students entering their second year will have three 8ams in most weeks. Increasing student numbers are behind these early starts, which have put pressure on University timetabling because there are not enough large lecture theatres available to teach all students within normal hours. This increase in student numbers is a conscious choice by the University as part of their Estates Masterplan. The University has chosen to expand at their current rate, and it is becoming clear they have done so with little student input and no robust contingency plans. These 8am starts come after the Mount Oswald site construction has been delayed, causing issues for students moving across to Durham from Queen’s Campus. The Estates Masterplan doesn’t appear to be improving student experience, so why does it exist? The early starts will cause a variety of issues for students: those who live outside of Durham will struggle to make it to lectures in time; bar staff and others who work late will get little sleep; students will miss college breakfast; it will impact early morning sporting commitments; those with children/caring responsibilities will face difficulties; students with disabilities and/or chronic illnesses have expressed significant worries about a longer day and the effect on accessibility; and another hour of teaching eats into the work/life balance. The list could go on. It is also worth noting that the University has stopped making the X12 bus service free for students, so those who require the bus to get to an 8am on time will now have to pay. Further to this, lower income students are more likely to experience a greater negative impact as they may need to live in cheaper areas of the city, further away from academic departments. These 8am lectures represent a step backward for accessibility and diversity in Durham. The Palatinate article was the first I – as Students’ Union President – heard about an issue that has severe implications for the student body. This shows a complete lack of commitment to student consultation, and sets a poor precedent for the Estates Masterplan as a whole. I have expressed these concerns in Senate and in meetings with Alan Houston, Pro-Vice-Chancellor (Education), and Michael Gilmore, Academic Registrar. Alan Houston has since apologised for the absence of communication, but the apology comes too late, and shows that though aware of potential issues, the University were willing to push the decision through anyway. The University has now committed to asking affected students whether they would prefer lectures to take place at 8am or 6pm, but this piece of token consultation is in no way good enough recompense for the initial lack. Students have little faith in the Estates Masterplan and the University is failing to offer reassurance. These 8am starts suggest a lack of commitment to student consultation that the University should not get away with. 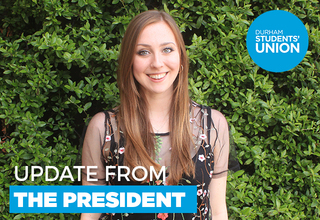 Keep an eye on your inbox for emails from the University or academic reps for further developments.